During the academic year, Nick Savino ’19 is a busy guy. The junior from Bristol, Connecticut, is a physics major with minors in math, history, and business. He’s a Westover Honors student and a member of Lynchburg’s varsity tennis team. This summer, Nick applied his laser-sharp focus on a unique project, spending more than 200 hours over eight weeks developing a system to measure the magnetic properties of materials that are 100 nanometers thick — think a human hair, divided by 1,000. “I was looking for something to do over the summer to continue learning about physics and doing research over the summer, and this was a great opportunity here on campus,” he said. Physics professor Dr. William Roach invited Nick to continue a project that he initiated in 2014. Nick received a research grant, funded by NewMarket Corporation through the Virginia Foundation for Independent Colleges, to support the summer research. The project examines a scientific phenomenon called the Magneto-Optic Kerr Effect, or MOKE, discovered by Scottish physicist John Kerr in 1877. MOKE describes the changes in light when it reflects from a magnetic material. Based on those changes, magnetic properties of the material — saturation magnetization, residual magnetization, coercive field, etc. — can be determined. Building a system to measure magnetic properties has been on Dr. Roach’s to-do list for several years. “I’ve always wanted to set one of these [systems] up,” he said. “When I was in graduate school, I did work on superconducting thin films. That’s a much more expensive field because you need cryogens, like liquid helium, that are more expensive. Alex Vaughan ’17 worked on the project for his independent senior research, and Nick helped pick up where he left off by building a device to measure MOKE in nickel. 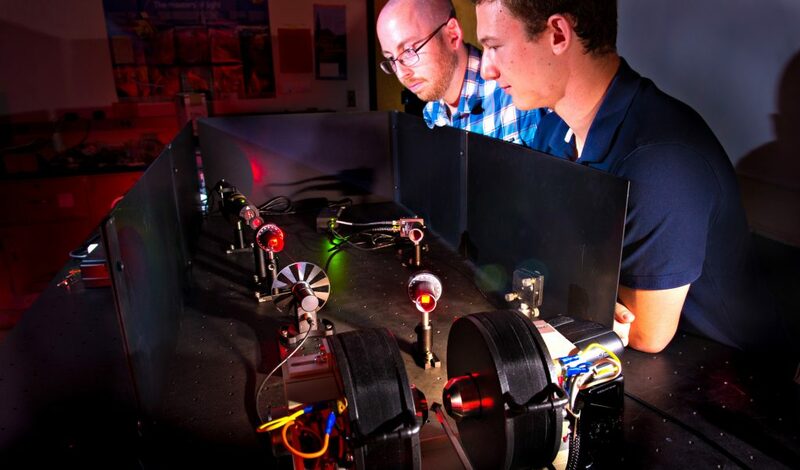 Although commercial systems for measuring magnetic properties are available, Dr. Roach wanted to give students the opportunity to be involved from the beginning to the end. Nick admits he didn’t know much about MOKE at the beginning of the summer. “I’d seen polarization and studied magnetism and optics, but this was the first time I really combined the topics,” he said. Currently, Nick is working to calibrate the system using commercially available materials. Further research, using what Dr. Roach described as “more specific materials of interest,” will have to wait for another student, and possibly another summer.